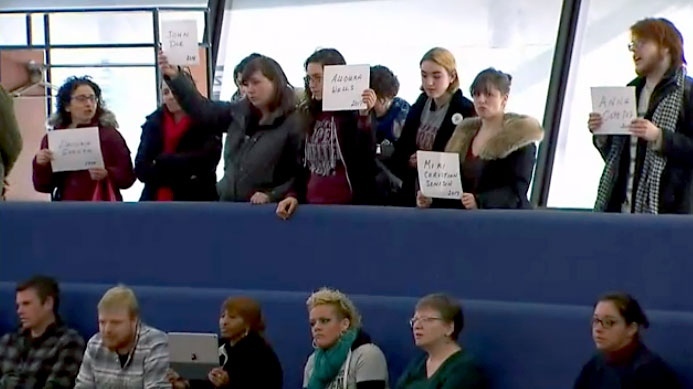 A group of protesters crowded into council chambers this morning, demanding that the mayor and city council do more to immediately add additional beds to the city’s shelter system. The group said while 1,500 new shelter spaces are needed, 1,000 should be added to the shelter system immediately. Several participants were escorted out by police, prompting some fellow protestors to break out in applause. “The preliminary budget championed by Mayor John Tory adds a maximum of 361 new shelter beds this year. That's less than a quarter of the 1500 that are necessary to guarantee a bed for everyone in need,” OCAP said in a news release issued Monday. In recent weeks, the mayor has taken steps to address overcrowding in the shelter system by opening a number of winter respite sites, including one on Davenport Road that will eventually be converted into a permanent shelter. In total, eight winter respite sites are currently open in the city of Toronto. Tara Hird, who is 35 weeks pregnant and has been staying at the winter respite centre at the Better Living Centre for the last couple of weeks, said she has been unable to find suitable housing. “It’s been hard. I’m sleeping on a mattress right now. The showers aren’t really a situation that for a pregnant woman I can have a shower. The bathrooms are quite ridiculous. I mean there is a lot of people doing drugs and what-not in them,” she said. She said she has tried to get into a family shelter but has been told there is nothing available. “Staff have tried to help us and it is just not working,” she said at city hall Monday. The proposed 2018 capital budget recommends adding 1,000 new beds to the shelter system over the next three years. "We are looking at well over 1,000 new beds that we're looking to get in but that's going to take some time to implement," Coun. Gary Crawford told CTV News Toronto. "Staff is working on those 1,000 beds but it is going to take some time." While the mayor has also asked city staff to make the beds available as soon as possible, OCAP says the number the city is offering isn't enough. “The expansion can only proceed if necessary funds are allocated in the 2019 and 2020 budgets. But even if the money is approved and the total number of homeless people doesn’t grow in that time, shelter occupancy will still be above 90 per cent in 2021. This means hundreds of people will continue to not be able to secure a bed on a given night,” OCAP added in its news release.